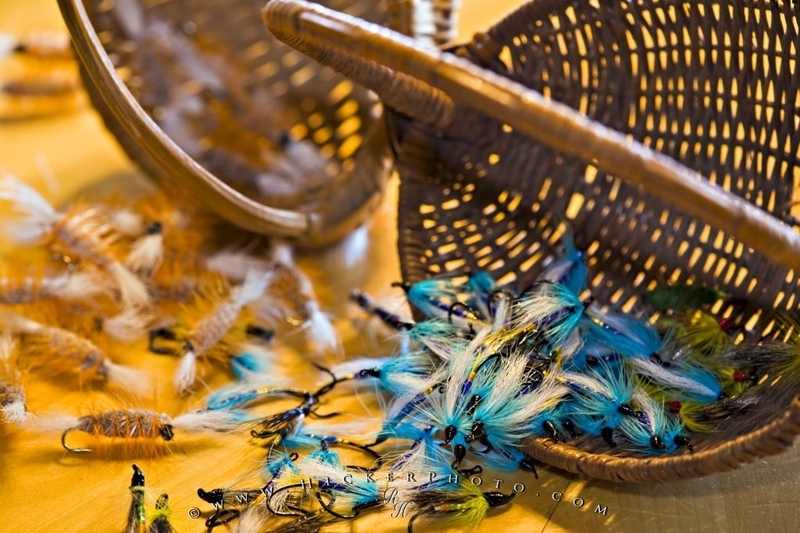 A picture that thrills fishermen is a table strewn with multi-colored fly fishing flies which are tied and ready to be used. Photo of an assortment of fly fishing flies laid out on the table at the Rifflin'Hitch Lodge in Southern Labrador, Canada. ... The most important requirements for fly fishing is a good rod, reel and the proper flies. Fly tying is an art that takes a while to master, but like anything, the more practice you put in, the better you will get at tying flies. While staying at the Rifflin'Hitch Lodge in Southern Labrador, the flies are already made up for your fly fishing adventure in the breathtaking wilderness of Southern Labrador.Fly Fishing flies at Rifflin'Hitch Lodge, Eagle River, Southern Labrador, Labrador, Newfoundland Labrador, Canada. I photographed this photo with the digital SLR camera model Canon EOS-1Ds Mark II, aperture of f/5.6, exposure time of 1/1 sec. on ISO 100, as always I used a original Canon Lens, the focus lenght for this picture was 180mm.